Rowe believes cities should be collages of utopia and tradition, exhibit and scaffold, etc. Colquhoun states that Graves’ work is a collage of various overlapping languages such as form, function, structure, and history. → Both Rowe’s ideal city and Graves’ work are collages of different elements. However, they are concerned with collages at different scales. Rowe is concerned with the relationship between buildings and its urban context. He is interested in its relation to surrounding buildings, surrounding urban conditions such as parks and roads, and the historical context of its site. Graves is concerned with the relationships between the elements within buildings. For example, in his later work he experiments with architectural forms such as arches and columns. He is also interested in the relationships between buildings and nature (According to Colquhoun, “[Graves’] houses respond to the natural environment, which itself is modified by the building.”) His work is not concerned with the building’s connection to its urban context. 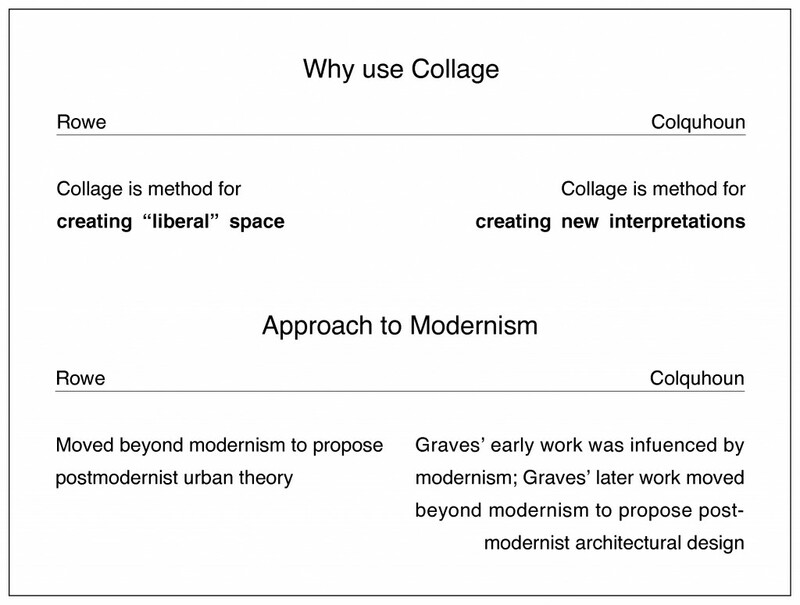 → Rowe’s collage is at the urban scale, Graves’ collage is at the architecture scale. Rowe states that architecture can never be scientifically resolved. He borrows the term “bricolage” from Claude Levi-Strauss to explain that urban planning should be based on the principles of bricolage. The elements within Graves’ early architecture do not have historical connotations. Colquhoun borrows the term “myth” from Roland Barthes to explain how these de-historicized elements can be considered to be mythical and timeless. 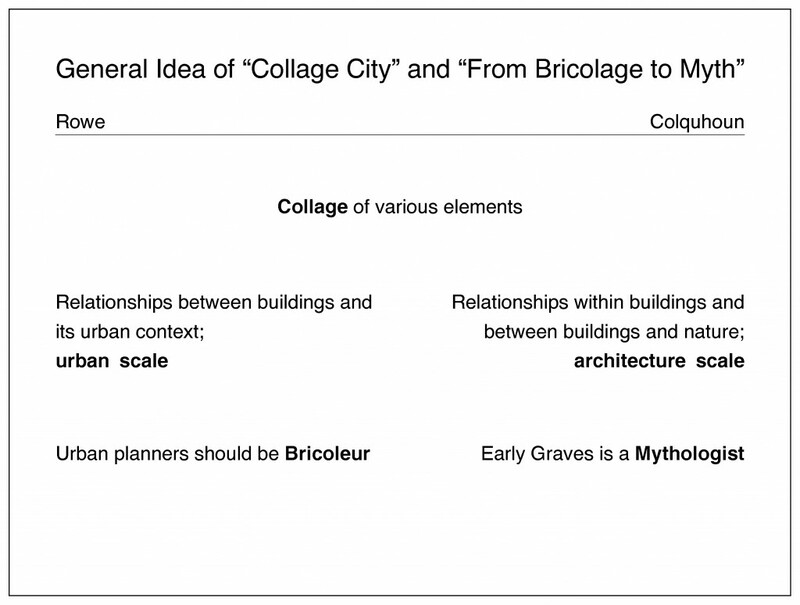 → According to Rowe, urban planners should be bricoleurs; according to Colquhoun, early Graves is a mythologist. Elements within Rowe’s collage city retain their connections to their source and origin. His collage has a non-chronological approach to history; it is up to the subjective opinion of the urban planner to imagine how traditional and utopian elements should coexist in the city. According to Colquhoun, in Graves’ early work elements within the collage are based on modernist forms that do not retain their historical meaning. In Graves’ later work traditional ornamentation with historical connotations is added to the earlier, minimalistic architecture. → Therefore, both Rowe’s collage city and Graves’ later buildings work with forms and history from different time periods. However, Rowe has a non-chronological approach, while Graves’ later work is chronological in that it builds upon the modernistic elements of his earlier work. Rowe believes that in the collage city, multiple layers of history should lie in a condition of “inter-dependence, independence, and multiple interpretability.” In other words, the city should be in a state of historical Palimpsest. New cities should be designed with these multiple layers of history, as if it had been built over a long period of time. Graves does not consider the surrounding urban context when designing a building; he begins with a blank slate = a tabula rasa. → Rowe believes new cities should be designed as a palimpsest; Graves begins with a tabula rasa. 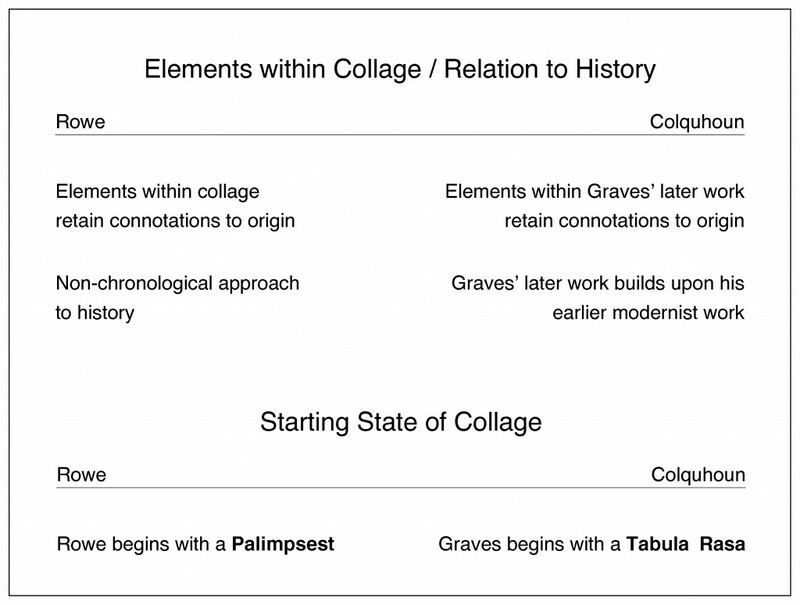 → For Rowe, collage is a method for creating liberal space; for Graves, it is a method for creating new interpretations. Unlike the modernist architect who was an engineer, Rowe believes architects should be bricoleur; unlike the modernist architects that advocated one, all-encompassing method of organizing the city, Rowe advocates collage. Rowe has moved beyond modernism into post-modernism. In the beginning, Graves created minimalistic architecture heavily influenced by modern architecture. Later on, Graves added figurative, historical elements to his earlier minimalist work and moved beyond modernism into postmodernism. → Both Rowe and Graves learned from the shortcomings of modernism to propose a postmodernist urban planning/architecture methodology.